No, it's not the Wild West. It's Sihanoukville, or Snooky, a port city on Cambodia's coast popular with backpackers in the 1990s thanks to its long empty beaches and chilled-out vibe - a quirky alternative to the tourist haunts in neighbouring Thailand. But now the backpackers are being run out of town by a new wave of tourists. Last year, 120,000 Chinese visitors came to the city that only has 90,000 people in its urban centre - four times as many as the previous year. They flock here not for the sun and surf or to soak up the colourful culture, but to gamble. 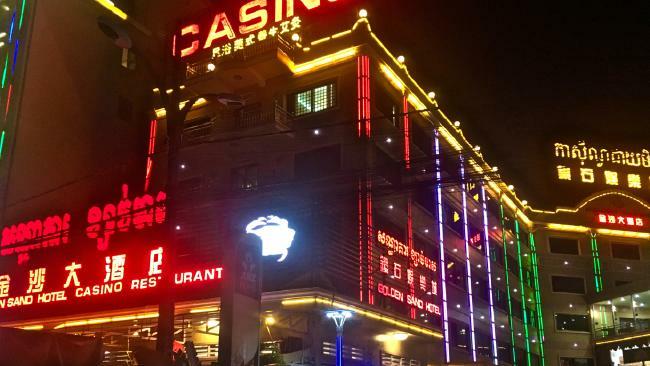 More than 30 casinos catering almost exclusively to Chinese gamblers have been built in Sihanoukville and there are another 70 more under construction. 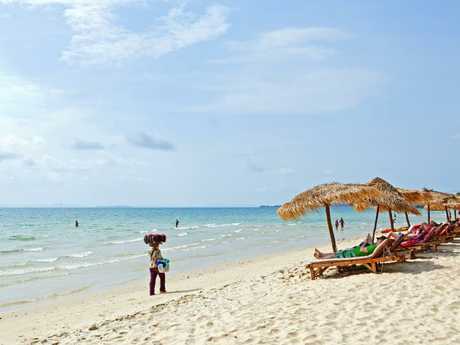 It was once known for this: Ochheuteal Beach in Sihanoukville, Cambodia. But a closed economic loop in which Chinese tourists patronise only Chinese-owned businesses who prefer Chinese workers means locals are being cut out of the action - and squeezed out of their own town. "Chinese people took away my city," says Sono, a tuktuk driver, "and now everything is more expensive. Before we paid $50 for rent. Now this year, $150. I worry about the future the Cambodian people in Sihanoukville. Soon we will not be able to afford to live here". Serendipity beach used to be full of backpacker bars. Now it’s a rubbish dump for construction waste. "These guys could have been gunned down. 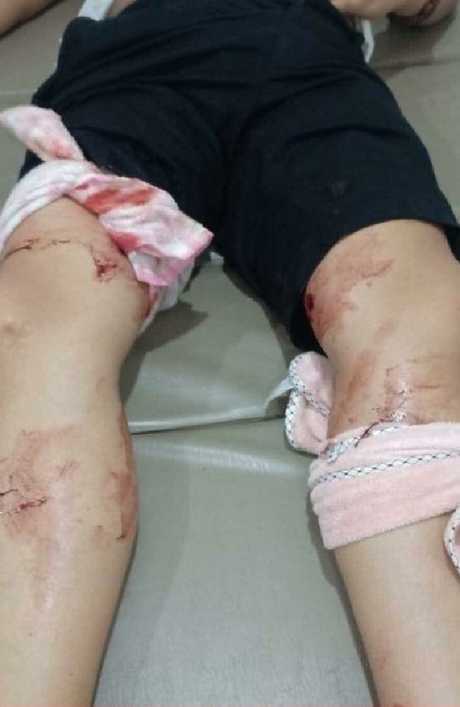 But they were kneecapped instead," wrote a member of the Expats and Locals living in Sihanoukville Facebook page. Added another: "It will get even worse. Crime is going up. The casinos are attracting any more gold diggers." 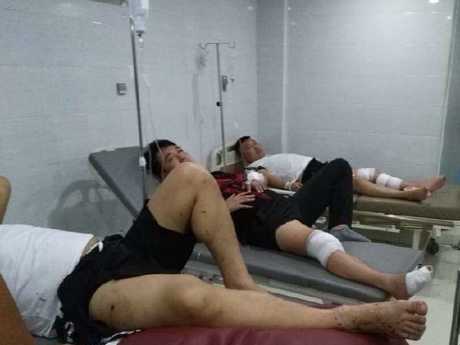 Last week's shooting was one in a long line of crimes - assassinations, kidnappings, extortions and brawls - blamed on Chinese tourists and Chinese expatriates living in Sihanoukville. 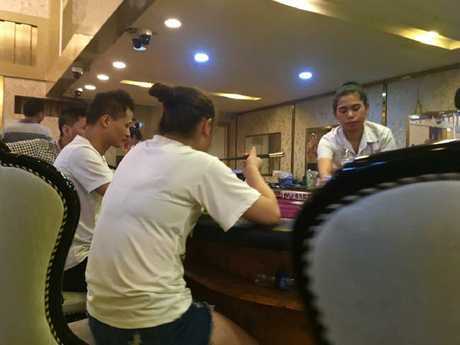 Three of the Chinese tourists who were shot while dining in a Chinese restaurant in Sihanoukville. 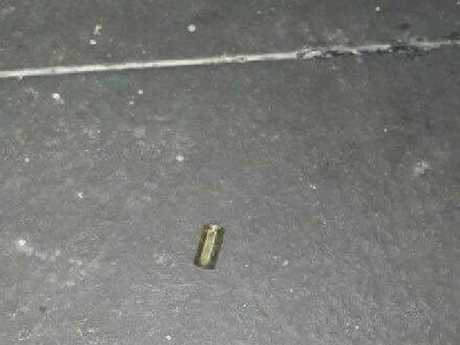 Bullet casing on the floor outside the scene of the mass shooting. "The influx of Chinese tourists have created opportunities for Chinese mafia to come in and commit various crimes and kidnap Chinese investors, causing insecurity in the province," wrote Sihanoukville Governor Yun Min in a recent letter to the Interior Ministry, which governs the Cambodia National Police. "Some foreigners are drunk and have conflicts, then fight each other in the restaurants and also in public." "We still keep our sovereignty, the Chinese can't control us," he said. Construction waste being burned right in front of Ochheuteal Beach. "Today on the beach there, a Chinese strangled one of the beach kids. He hurt him so badly they had to call an ambulance to take him to a hospital," Alyse Porter, an English teacher from Melbourne claimed. "The police came but they let him go because they said it was wrong guy," she added, shrugging her shoulders. A gunshot wound victim in hospital. 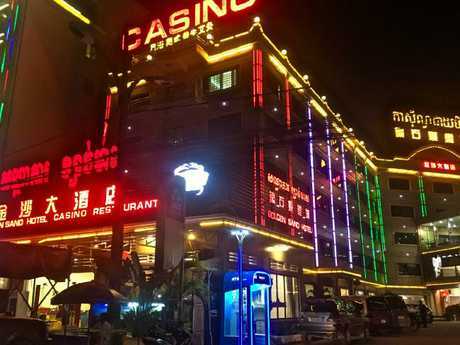 Cambodians are not allowed to enter Sihanoukville's casinos unless they work there. Westerners are also a rare sight. I attract curious looks from the security guards as I walk through the security metal detector at Oriental Pearl Casino - yet they don't bat an eyelid when the metal detector goes off. Inside is a smoke-filled ballroom where thousands of Chinese men and women sit around tables playing baccarat while chain-smoking cigarettes, which are complimentary. Beer is also offered free, but I don't see a single gambler drinking booze. They guzzle energy drinks instead. "The Chinese (tourists) are really strict people. They are not friendly," he says. "They don't like fresh air. They only like to gamble. 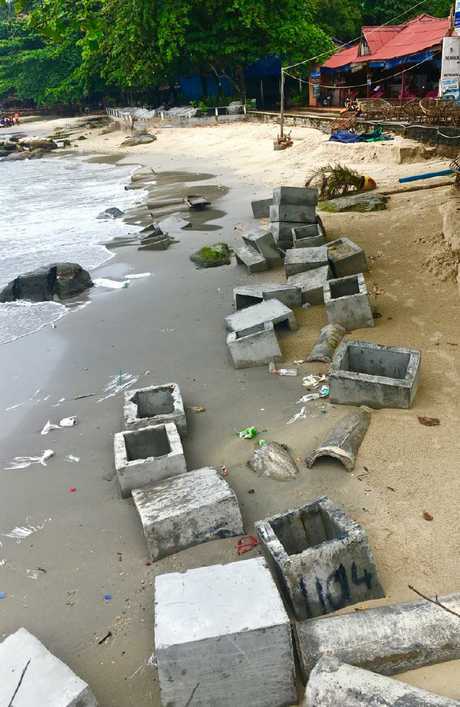 In Sihanoukville, we have so many problems because of them. They are fighting Chinese against Chinese and sometimes they fight Cambodians but no one gets involved because everyone is scared of them. "If the Chinese guy has a problem with the police, he just pays them money and the problem goes away." The following day, I walk down to Serendipity Beach. The last time I was here in 2004, a handful of backpacker bars dotted the beach. Now those bars have all been demolished - concrete shells on vacant, rubble-covered land snapped up by Chinese investors and signposted by billboards with Mandarin lettering and renderings of glitzy high-rise hotels. From Serendipity I walk south along Ochheuteal Beach. The water is caramel-coloured and looks nothing like the idyllic postcards of Sihanoukville. The sand is pockmarked with rubble - tailings from garish neoclassical condos that rise like concrete dragons over the pine trees. Just before a headland is a row of seafood restaurants that until recently catered to Cambodian day trippers. Now they too have been demolished. The leftovers - tonne upon tonne of concrete, timber, plastic and plaster has just been dumped on the boardwalk. A small crew of construction workers are setting fire to a few of the piles, sending plumes of acrid black across the beach. 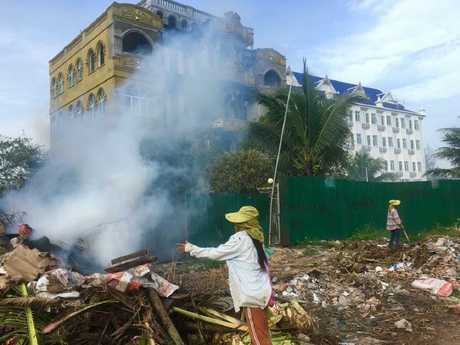 "They just dumped it all there," says Tiwi, a Cambodian man who disapprovingly looks on. Until recently, he used to earn a living shuttling backpackers to and from Sihanoukville Airport. But now he says Chinese tourists only use Chinese drivers, and he had to sell his minibus to a Chinese businessman to pay his rent. Tiwi believes within a few months he will have to return to his home province and his old job - backbreaking rice farming. 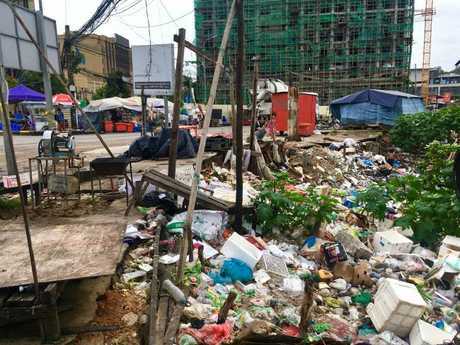 "Before I had many clients from Australia who used to come here but now they say they don't like to stay in Sihanoukville because of all the construction and rubbish," he says. "This city has been lost to China." 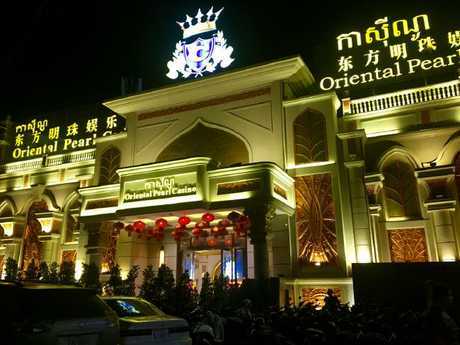 One of Sihanoukville’s 30 casinos. There are 70 more under construction.